Storytelling and creative activities for children and adults, schools, museums, libraries, community groups, inset days and training. The Crowman combines the telling of wonder tales, myths and fables with activities to stimulate creative play and imagination. In a range of workshop sessions for all ages and abilities, participants use listening skills and are engaged in making various types of masks, puppets or simple musical instruments. This can then lead to follow up work, such as creative writing and the use of the items made in displays, presentations or celebration. The sessions are designed to meet the requirements of schools, libraries, museums, galleries, training centres and community groups. All materials are provided. 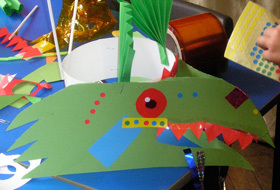 Other activities can include making giant puppets, processional dragons, kites, scrap and ephemeral sculpture and science and design technology projects. References available on request. CRB check and current Public Liability Insurance.